Despite my deep love of sketchbooks, I couldn’t envision them as the subject of a movie. At least not an interesting one. 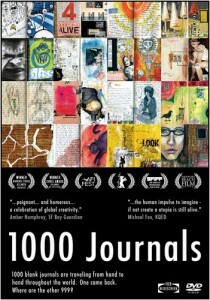 Despite long odds, filmmaker Andrea Kreuzhage accomplished that very unlikely task with 1000 Journals. The movie tells the story of the 1000 Journals Project, an experiment in which a San Francisco-based graphic designer named Someguy released 1000 blank journals into the world, hoping that people would add to them and return them. Since it began in 2000, the project has involved hundreds (if not thousands) of participants in more than 40 countries and all 50 of the United States, as well as yielded a 212-page book and an exhibition through SFMOMA. Kreuzhage began work on the film in December 2003, spending the next five years traveling the globe to interview nearly 500 contributors to the 1000 Journals Project. According to the film’s website, the crew shot about 165 hours of film, took well over 7,000 still photos, and made about 2,400 high resolution scans of about 80 journals. The stories Krezhage collected, while engaging on their own, have even more power when taken together. In that sense, the movie is much like a sketchbook; the individual parts are given greater meaning and depth when taken as a whole. 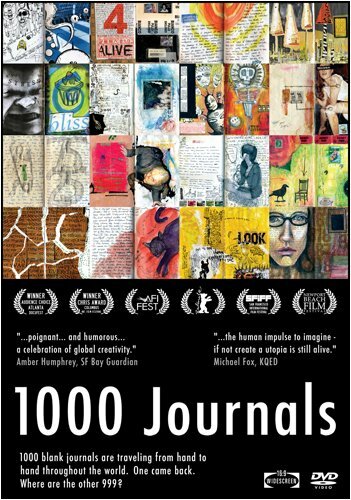 The film showed perfectly the power of the 1,000 Journals Project, capturing the spirit of collective creativity that has driven thousands to participate. Sketchbooks, the process of making, and creativity across disciplines. And anthropomorphic chimps. Bob Fisher has been at various points in his life an artist, writer, teacher, art director at Cartoon Network, owner of a marketing communications firm, director of communications at a private school, a loading dock worker at a hospital, and a cabinet maker's assistant. He now runs sketchbob.com, an online gallery of his sketchbook work, and writes about the creative process and creativity across disciplines on Sketchbob Sketchblog (sketchbob.blogspot.com). He also speaks to student, business, and trade groups on the topics of creativity and art. Bob holds degrees in art and in business.